By announcing boards for small communities, she tries to check influence of Gorkhas. 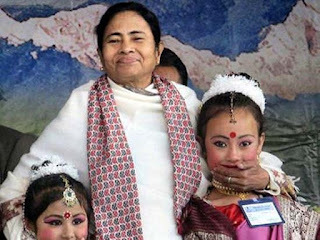 By announcing three more development boards for small communities in the Darjeeling hills, West Bengal Chief Minister Mamata Banerjee has taken the identity politics to new heights. “When I come to the hills, there are demands for development boards. People say they should also be given a chance to develop. We will form three development boards for Kami, Damai and Sarki,” Ms Banerjee said last week. Interestingly, since the mid 1980s, the Darjeeling hills have witnessed the rise of identity-based politics centred on demand for a separate State of Gorkhaland, which was always resisted in the plains of Bengal, mostly inhabited by the Bengalis. From the Subhash Ghising-led Gorkha National Liberation Front (GNLF) to Bimal Gurung’s Gorkha Janmukti Morcha, the issue of Gorkhaland has dominated politics of the hills. By announcing boards for small communities, she tries to check influence of Gorkhas. By announcing three more development boards for small communities in the Darjeeling hills, West Bengal Chief Minister Mamata Banerjee has taken the identity politics to new heights.